Global warming makes it colder? We have already had significant ice at this point in the season. As it was, it took days for the last ice to clear from my HF dipole. 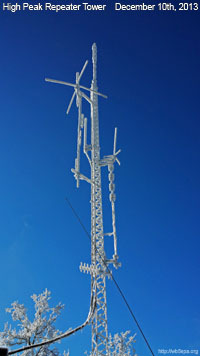 When I saw this image (The High Peak tower) it kind of inspired me to hook a transmatch to an icicle to try my luck. Then again, it’s way too cold out there, and I might be inspired, but I’m not THAT motivated. Click image for larger one from orignal source. This entry was posted in General by w5mz. Bookmark the permalink. Hello just had time to look you up. Great page. Was looking for somewhere to put my 2 cents worth in. Why aren’t all repeaters TONED? And why is it I never hear this old guy that has a thirty year old rig with no tone board on the air? Oh well nice chit-chating with you this AM.